Cruise ships are continuing to stoke their passengers’ appetites for Maine lobster. Celebrity Cruises ordered 1,600 lobsters for delivery Friday to its 2,000-passenger boat, the Celebrity Summit. When the ship returns to Portland later this month, it plans to buy another 1,600 lobsters. That’s on top of the 640 lobsters the company bought last month, according to a press release from U.S. Rep. Chellie Pingree. Two years ago, Pingree wrote to the chief executives of several major cruise ship companies urging them to buy local lobsters while in port. At the time, there was a glut of lobster, depressing prices for the entire industry. Celebrity and Norwegian cruise lines responded by buying Maine lobsters. Others have as well. Erik Elvejord, a spokesman from Seattle-based Holland America Line, which brings approximately 35,000 passengers to Bar Harbor and Portland each year, said they continue to make an effort to buy local lobster during stops in Maine. Read more of this story by Jennifer Van Allen in the Portland Press Herald. Three Maine newspapers restore online comments | Bangor Daily News. Phish to perform in Augusta in October | The Portland Press Herald / Maine Sunday Telegram. Below is the text from a press release I received via e-mail from Susan Ropars of the Higher Ground Singers. It is pretty much the same information I passed along yesterday from the Portland Press Herald, but it doesn’t hurt to pass it along again. 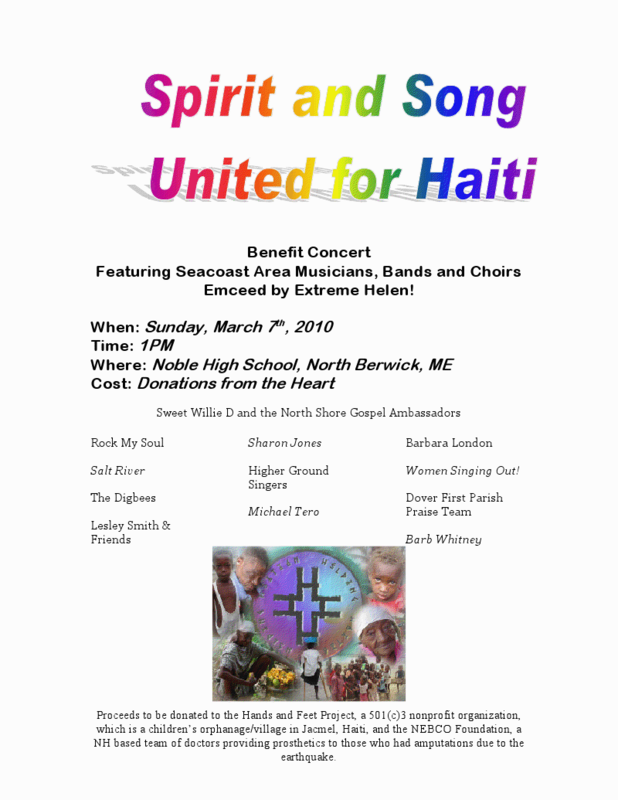 Benefit Concert for Haiti: Higher Ground Singers, directed by Michelle Lessard, is excited to be hosting “Spirit and Song United for Haiti” at 1PM on Sunday, March 7th at Noble High School in North Berwick, Maine. Featuring a wide variety of Seacoast Area musicians and talents, this event is sure to appeal to all ages. Helen Ksypka, aka Extreme Helen, will emcee the benefit, which includes such local legends as Sharon Jones, Barbara London, Salt River, Rock My Soul, The Digbees, Lesley Smith & Sammie Snail, and Women Singing Out! Other performers include Barb Whitney, Michael Tero, The Dover First Parish Praise Team and Sweet Willie D & The North Shore Gospel Ambassadors. As always, do your homework before giving to any organization. The Better Business Bureau is always a great place to start to check out a charity. Below is the top of a story by Portland Press Herald staff writer Matt Wickenheiser and a link to the rest of the story. Along with the story on the Portland Press Herald Web site is a letter to readers from Scott Wasser, vice president and executive editor of the Portland Press Herald/Maine Sunday Telegram and MaineToday Media. Apparently, a couple of readers emailed complaints to the newspaper claiming it would have been better for the publication to donate the money to a charity rather than spend money to send reporters to Haiti. The response has a tone of indignation to it, but Mr. Wasser makes very important points: covering Mainers doing good – no matter where – should be done by a Maine newspaper. Period. And, more importantly, the coverage is sure to garner not just short-term replenishment of funds for charitable organizations, but long-term positive results for those groups that do good in Maine and beyond in places such as Haiti. CAP HAITIEN, HAITI — Earthquake victims from the south came in buses, piled into pickups and jammed into cars, driving almost 90 miles to find any care they could – even at Haiti’s poorest hospital. Justinian Hospital doctors, nurses and residents worked through the first weekend treating 130 patients from Port-au-Prince, the capital city destroyed by the Jan. 12 quake, which killed an estimated 200,000 people. With sparse resources, they helped men, women and children who had broken bones, amputated limbs and crushing emotional and psychological truama. And members of the Portland-based Konbit Sante worked alongside them. Haitian nurses and doctors from the nonprofit were there, even a Portland volunteer who teaches English as a second language. But as important as the all-hands effort was, it may not have been possible without the work done by Konbit Sante over the past decade. Justinian doctors and nurses were able to work in operating rooms without fear of a blackout, thanks to electrical upgrades made by Maine electricians; children were treated in a pediatrics unit supported by two Konbit Sante-funded attending physicians; and the opening of a Konbit Sante supply depot gave the hospital access to vital materials donated to the organization. Even so, scraping together enough to respond to the disaster has been difficult. Click the link to read the rest of “Quake spotlights Haiti’s distress, nonprofit’s resolve” by the Portland Press Herald’s Matt Wickenheiser. Here’s another “reporter’s notebook” from the MaineToday Media covering the earthquake in Haiti. Reporter’s Notebook | Portland Press Herald. I was so busy the past couple of days passing along links from the home pages of Maine newspapers that I failed to take a look at the landing page set up on the Web site of MaineToday Media’s Portland Press Herald. That will bring you to a landing page with a multimedia presentation. There are local stories and commentary, wire stories, tweets, slideshows, and information on how to donate to the Haiti relief effort. It’s not a bad collection of what’s been written by MaineToday Media so far on the earthquake in Haiti. The one thing it lacks – at least from a cursory standpoint – is video. But that is highly understandable under the circumstances; newspapers are not set up to broadcast video via satellite and getting a memory card to the mainland to be edited and sent to the MaineToday Media websites wouldn’t make sense. My hope is that the reporters and photographers – perhaps a videographer – are taking video so that can be added to the landing page later. I’ll post other landing pages if I spot one by a non-MaineToday Media paper. Here’s a link to a series of “reporter notebook” items by Portland Press-Herald reporters and photographers covering the earthquake in Haiti. These are the sorts of things that reporters find interesting and jot them down in their notebooks, but often they do not make it into the bigger, overall story. Here’s a link to the rest of the reporter notebook. Here are links to Portland Press Herald stories about Mainers helping Haiti. Please let me know about any failed links and I’ll attempt to fix them as soon as possible. Ray Routhier does everybody’s job. Really. He’s a Portland Press Herald staff writer who does unusal jobs found in Maine and then writes about them. Here’s the link to the story he wrote about learning to be an “ice technician.” He got to drive a Zamboni. Sweet! Maine at Work: Skirting the boards might be easiest part | Portland Press Herald. A main function of a free press is to make sure that agencies taking public money do what they should be doing with that money and that the people working for those agencies are not pocketing any of it for personal gain. Part of that “watchdog function” involves usually costly, usually time-consuming investigative reporting to ferret out corruption, incompetence and whatever other problems there might be with the way an agency’s employees are dealing with the public’s money, property or facilities. Because of the way things have gone for news gathering agencies, especially newspapers, newsrooms have been gutted and meaningful investigative reporting has greatly suffered for years. But nonprofit organizations or organizations funded by foundations and donations are sprouting up in an effort to fill that gap. In Maine, one such agency is the Maine Center for Public Interest Reporting founded by – and so far funded by – longtime journalist John Christie. The Center claims affiliation with the New England Center for Investigative Reporting at Boston University. Christie’s venture seems to be still getting off the ground, but it did produce a lengthy piece on recent tax reform in Maine. The story strongly suggested that Maine Gov. John Baldacci’s decision to not include a tax on the sale of luxury homes and a sales tax on ski lift tickets was influenced by lobbyists with whom he had close, long-term political relationships. The Center’s media partners include the Bangor Daily News, Lewiston Sun Journal, Mount Desert Islander, and The Ellsworth American. Apparently, his departure from the Central Maine Newspapers – Portland Press Herald, the Kennebec Journal and the Waterville Morning Sentinel, among others – didn’t go so well since the Center’s story was not slated to appear in those publications. As an out-of-work editor-columnist-blogger, I hope Christie’s effort and those of other nonprofit public service news organizations prosper and grow, and that their leaderships figure out what news executives should have figured out decades ago – sustainability. Frankly, I don’t know if nonprofit is the way to go. Below are links to just a few of the nonprofit public service news websites. More and more nonprofits are cropping up and using something such as “nonprofit journalism” should provide a lengthy list. California already has a handful. The Sacramento-based California Watch is a project of the nonpartisan Center for Investigative Reporting. Here’s a link to a blog about California Watch prior to its launch. There is also the SF Public Press, which is sponsored by the San Francisco Foundation, Independent Arts & Media, and at least 200 individual donors. VoiceofSanDiego.org is another nonprofit, public service journalism project. Also, here are links to two DownEast.com blog items on the launching of the Maine Center for Public Interest Reporting, one by Al Diamon and another by Mike Tipping. Both are regular bloggers for DownEast.com. Maine already has land-based windmill projects and tomorrow a panel will name locations to be tested for offshore wind fields. Here’s the Associated Press story printed in some Maine newspapers.